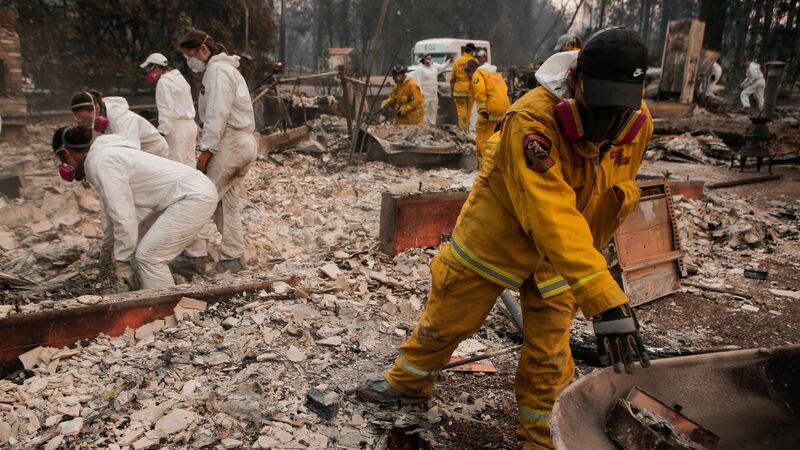 The Butte County Sheriff on Monday reported 13 more fatalities had been discovered on Monday from the Camp wildfire, which all but wiped out the town of Paradise, located about 90 miles north of Sacramento. This brings the death toll to 42, which eclipses the Griffith Park Fire of 1933 as the deadliest wildfire recorded in state history. It already holds the title of the most destructive wildfire on record. Details: With more than 200 people still unaccounted for, the death toll may increase further. The wildfire has consumed over 6,400 homes. The latest death toll comes after President Trump said on Twitter that he had approved a request to declare the fires in California a major disaster. People affected would be eligible for federal government aid. The big picture: The Camp Fire is part of a spate of destructive wildfires that have ravaged California communities in the north and south, with evacuations still in effect in parts of Ventura and Los Angeles counties due to the damaging Woolsey Fire, which has claimed 2 lives and destroyed more than 300 structures. The fire that swept through Paradise was propelled by powerful offshore Santa Ana winds, which blew at hurricane force at times, giving residents little to no time to prepare to evacuate. Harrowing video has emerged of people driving out of time as flames consumed the vegetation along the road. Some cars were overtaken, with bodies found in vehicles. The ongoing Santa Ana event is forecast to continue through at least Wednesday in most areas affected by the latest round of wildfires. The climate piece: Fire season is now running year-round in California, and studies show that warmer, drier dry seasons that last longer into the fall and start earlier in the spring are consistent with expectations from climate change. The trends: California is experiencing one of its worst wildfire seasons on record, on the heels of a historic 2017 season as well. This year, the Golden State had its hottest month in state history and was scorched by the largest fire the state has ever recorded. According to Aon Insurance meteorologist Steve Bowen, 7 of the 20 most destructive fires in the state have occurred since October 2017. One of the biggest changes firefighters are having to contend with is an uptick in instances of extreme fire behavior, such as the massive EF-4 fire tornado that accompanied the Carr Fire in July, as well as the blaze that tore through Paradise.